Senior Chase Miller battles for possesion of the ball during a game last season against St. Catherine University. The team started their season with a win against Redlands and a loss against Chapman. Women’s Soccer kicked off their 2018 season with a intensive preseason practice schedule, filled with three-a-days, meetings, and fitness testing to prepare them for the difficult season ahead. Finishing sixth in the conference last season, the Gusties were the last team to qualify for the postseason playoffs. They showed their true colors however in this single elimination stage of the year, making it all the way to the MIAC Championship game despite their low seed. This playoff run was also highlighted by a close game against St. Thomas where Senior goalkeeper Ashley Becker came in clutch in penalty shootouts. Becker made two saves in the shootout propelling the team into the Championship match. 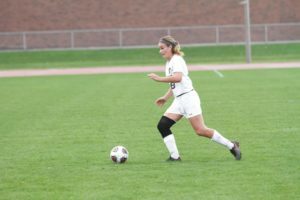 The Gusties faced St. Catherine in a hard-fought game that also went into overtime, but ultimately lost by a score of 1-0. The team looks to improve on the impressive run they made last season but will have to do so without its First Team All-American Goalkeeper. Becker unfortunately suffered a knee injury this summer and will be out for the season. Gustavus will look to First years Abby Goodno and Leah Pavlish to replace her. Despite this setback, the team is ready to take on whatever is thrown at them this season and is excited to start conference play, according to Head Coach Laura Burnett-Kurie. The Gusties’ season started with a trip to California where they defeated University of Redlands 4-1 and lost to Chapman in a close 1-0 game. The team showed out in its first game of the season, defeating Redlands by a score of 4-1. Gustavus scored the first four goals of the game coming from Sophomore Lauren Johnson, Junior Abby Mullenbach and Seniors Chase Miller and Emily Skogseth. Sophomore Lauren Johnson controls the ball through the midfield. Redlands answered back with a goal of their own late in the second half but was too late to make a comeback. Burnett-Kurie was excited about the result and the character the team showed. “Ultimately we worked super hard and worked for each other. This team has a ton of potential and we are excited everyday to get closer and closer to reaching that potential,” Burnett-Kurie said. The next day, the Gusties faced off against Chapman University. The team struggled to break down the Chapman defense, only recording four shots during the contest. The match was a stalemate until the Chapman offense broke through in the final minute of the game, scoring a goal against Pavlish and ultimately winning the game 1-0. As the team returned they got right back into action, taking on two more teams in the next week. In a packed weekend, the Gusties played back-to-back non-conference games against Nebraska Wesleyan and Wartburg Sept. 8 and 9, respectively. On Saturday, the Gusties took on the Prairie Wolves at the Gustie Soccer Field. This game was particularly significant for the team because it was the Second Annual Team Trina game. After Senior Trina Rinke was diagnosed with ovarian cancer, forcing her to sit out her junior season, the team implemented a charity game for her and cancer awareness. Trina is currently cancer free and in remission but the team wanted to continue this charity game to show their support and continue raising awareness about the subject. The game kicked off and the Gusties quickly got to work, scoring in the 30th minute on a goal from Senior Emily Skogseth. This proved to be the game-winning goal, as the two teams went scoreless for the remainder of the game. The next day, the team got right back at it, taking on the Wartburg Knights. After a hard-fought game, the Gusties found themselves on top 1-0 for the majority of the game. In the 86th minute, Wartburg netted a goal to force the game to overtime. The Gusties ended up letting in a goal to lose the game in the first minute of overtime. Despite the loss, Burnett-Kurie looks forward to the rest of the season and the direction the team is heading in.